Culture Electronic presents new bank sound for Gladiator 2 vsti from Tone 2. One big presets collection for one little price. Arp, At, Bass, Fx, Lead, Pad and Syn. 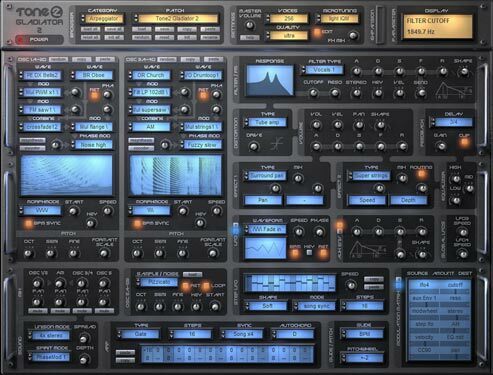 Increase new exciting sounds for Gladiator 2 Vsti.New patches in the follow category:Arp, At, Bass, Fx, Lead, Pad, Syn. Increase new exciting sounds for Gladiator 2 Vsti.New patches in the follow category:Arp, At, Bass, Fx, Leads, Pad. This Three Bank Sound are in Gladiator's own GLB bank format. Just load and Use it. After to check the payment confirmation by paypal e-mail. I will send in their e-mail for you personally within 12 hours - Of course, the more possible abbreviation, in small time possible. Usually instantly or within minutes.